Designed for all thermal transfer printers including Datamax, Honeywell, Zebra, Godex, Sato, TSC and Citizen. Arch Crown’s thermal transfer labels are made from high quality, tear resistant Polyester material. Polyester is virtually indestructible with superior print durability and can withstand ultrasonic cleaning; type printing and bar code images will not rub off. 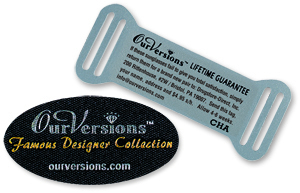 Computer string tags are designed with a string-like tail and adhesive free loops for easy tagging that won't stick to your jewelry. 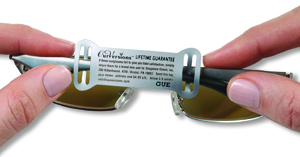 As a free service, thermal transfer tags are available on 1", 1 1/2" and 3" cores, please specify when ordering. Looking for these labels in color? Click here. Overall Size: 1/2" x 1 31/32"
Overall Size: 7/16" x 3 9/16"
Printable Area: 7/16" x 1 3/4"
Overall Size: 9/16" x 4 7/16"
Printable Area: 9/16" x 2 1/2"
Some desktop printers require the use of a narrower label. Overall Size: 7/16" x 1 7/8"
Overall size: 7/16" x 3 1/2" Printable area: 7/16" x 1 3/4"
Versatile computer string tags (with adhesive free adjustable loops) are designed for tagging jewelry and watches. Hi-gloss, laminated polyester material is stronger than polyester or Kimdura. Superior print quality and durability. Can withstand ultrasonic cleaning, text and bar code images will not rub off. Ideal for color coding, special promotional offers and inventory control. Overall size: 7/16" x 3 1/2"
Size: 1" x 1 1/4"